Fadeaway is a work of fiction (publication date June, 2018). Its people, places, and events are not real. It is not autobiographical in any way. However, any writer’s work is informed by her experiences. And that is true of Fadeaway. I grew up in Concord, New Hampshire, and bits and pieces of my childhood experiences definitely comes through in my story about Sam and Reagan in imaginary Carlow, New Hampshire. Elliot Park, where Sam runs and cuts through and thinks, has elements of White Park in Concord, which we always called Whites’s Park! I learned to skate on its frozen pond during the cold winter, starting out on double blades and advancing to ribbon in the annual Silver Skates contest during the Winter Carnival when I grew older. The park was close enough so that we could walk from our house, with tied skates hanging around our shoulders. I also learned to swim at the municipal pool right behind the skate house at White Park. Swimming underwater came easy to me, but keeping my head above water was quite a challenge. I eventually became a lifeguard and swimming instructor and worked at two other municipal pools in Concord, Rollins Park and Merrill Park, where I blew my whistle and issued timeouts to kids for cannonballing just like the lifeguard in Fadeaway! I loved basketball and played high school ball at Bishop Brady. I was a decent shooter, but current players would run me off the court! One of the great things about writing fiction is that you can put yourself in the shoes of characters with tons more talent! Our driveway hoop saw lots of action while I was a kid, including pick-up and many, many games of four aces. My younger sibings rivaled Sam and Luke in their ability to mix it up on that court. I played pick-up and league basketball for years. While I haven’t played lately, a basketball sat on the floor of my study while I wrote Fadeaway. I've always had a bike. 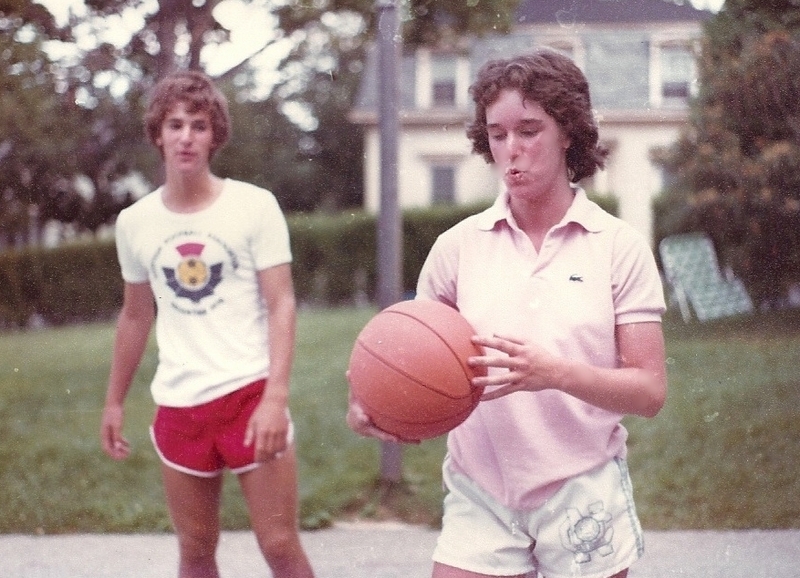 From learning to stay upright on my blue birthday Schwinn by riding it back and forth on our lawn on School Street, to cruising around an ever-expanding allowed streets in the neighborhood, to jaunts out to St. Paul’s School and Long Pond, I was always happy riding my bike. I rode out to Beaver Meadow to play golf, and I rode down to Rollins Park to lifeguard. In college, I rode to the UNC campus, and I ride for fun and exercise now. 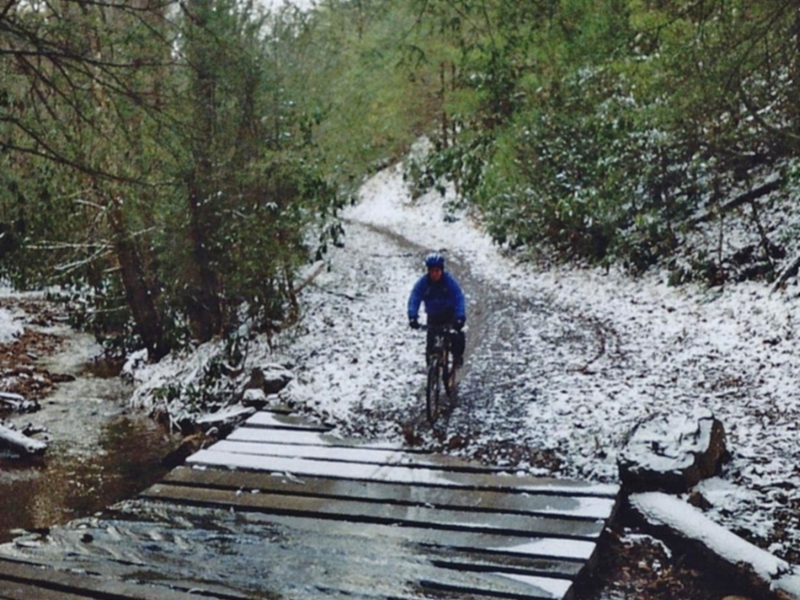 I don’t remember ever taking a bike out in the snow in New Hampshire, but I had a blast venturing down a snowy mountain bike trail in Virginia one recent winter. So while Fadeaway is fiction, you can see where some of the fuel for my imagination comes from real life.